A marine painting about change. Click on the image above or the images below to see more detail. 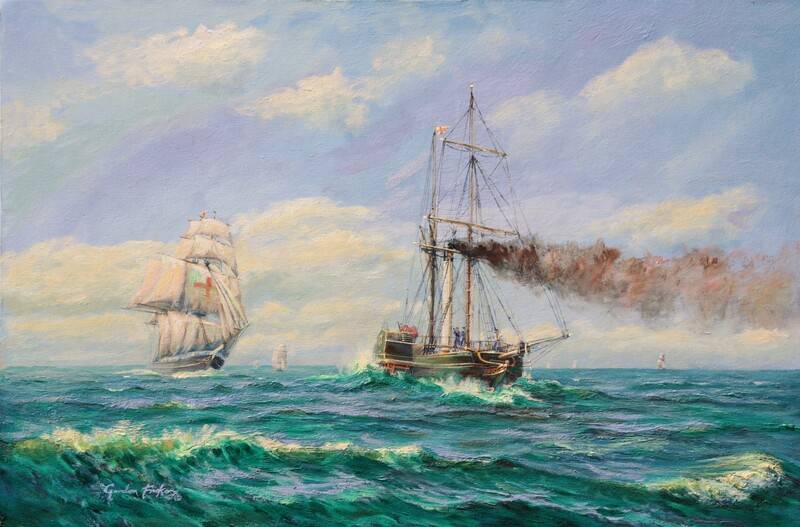 Marine painting by Gordon Frickers 51 x 76 cm (20″ x 30″), oils, available. Looking for the very best in marine art? You have found it here: Timeless paintings, the test of true greatness. The steamer “Sirius” being overhauled by the ‘crack’ Liverpool clipper “Dreadnought” ~ but history remembers better the diminutive Sirius. Sirius made the first powered only transatlantic crossing thus with her historic voyage a new age of ocean travel commenced. By arrangement payments can be in installments. How much in my currency? Try our free XE Currency converter.